Can you send me information on the product before I buy? If you need product information other than what is listed on the site, please contact us at wackywillys@gmail.com If additional information is available that is not posted on the Web, we will be happy to let you know. Are batteries included with those products that require them? Our merchandise does not include batteries. The product description usually specifies any merchandise that does include batteries. What if I am interested in a product that I do not see on the site? If you are interested in a product that you cannot find at Wacky Willy's Web, please send us an email at wackywillys@gmail.com We will respond to you within one to two business days. Although most online orders go very smoothly, occasionally you may experience some bumps in the road. If you are not sure what to do next to complete your order, the Shopping Cart is a good place to start. In most cases, you'll get back on track and easily complete your order. If you continue to have trouble with your order, please call us at 1-778-426-3335 or email us at wackywillys@gmail.com We will be glad to help you through the process. We process orders very quickly in order to provide our customers with excellent service. This does make it difficult for us to cancel or modify your order once it is submitted. If you change your mind once your order has been submitted, you have to tell us immediately by phoning Customer Service at 1 778 426 3335 . Will I receive an automatic confirmation that my order has been processed after I have placed my order? Yes, an email will be sent with your Order ID number and order information. Will I receive a confirmation when my order is shipped? Yes, An email will be sent once your Order is shipped. Please ensure you correctly enter your email address when placing your order. 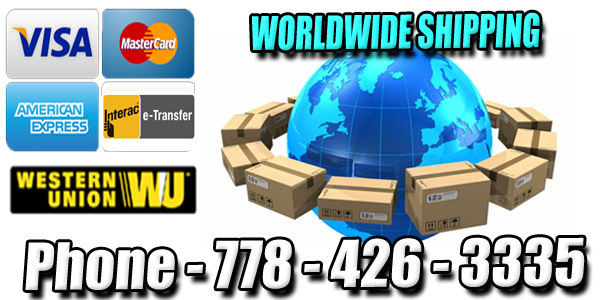 We accept VISA, MasterCard, American Express ,Western Union and International Money Orders. Please contact wackywillys@gmail.com or call 778-426-3335 for warranty information. Warranty covers only manufacture defects. Shipping charges apply for Warranty shipments. What do I do if my order was shipped incomplete or I received the wrong item? All orders are triple checked prior to shipping for quality and accuracy you have 7 days to make a claim. Contact us at 1-778-426 3335 or at wackywillys@gmail.com and a Service Representative will resolve the issue with you. We only collect the information necessary to process your order, and that is all it is used for. Your information stays on file on our copy of the invoice for reference purposes, but it stays within Wacky Willy's Web, and is not communicated to any other party. At no time do we intend to sell, rent or market personal data about you to third parties. Protecting your order information is our priority. We use Secure Sockets Layers (SSL) technology to protect the security of your online order information. Â© Copyright 2008. Wacky Willys. All Rights Reserved.